On my short journey between City Thameslink, and London Bridge stations, I sat next to one of the toilets. I also made use of the facility. As there is a lot of pressure to show Thameslink on the Tube Map, will these trains become the only trains on the Underground to have toilets? As modern controlled emission toilets, don’t throw anything on the tracks, they can be safely used anywhere. The title of this post is the same as that of this article on IanVisits. This post will be finished, when I get a few pictures. But in the meantime read Ian’s article. The Thameslink route, which runs North-South across London is used by different purposes, by different passengers. To many, who live close to its outer reaches it is a commuter railway into London. It serves two airports at Gatwick and Luton. Londoners use it to explore the delights of the South Coast of England. But to those who live in Central London like me, it is a useful rail line. I regularly use Thameslink for this route, as compared to the Northern Line. The trains are more spacious and are generally less crowded. It is less walking at Kings Cross. I have a convenient bus or taxi home from both end stations. I suspect, I use this route a couple of times a week. I like the Tate Modern and the gluten-free egg sandwiches are good. There is also restaurants in the area; Leon and Carluccio’s for a start, that are good places for lunch or dinner. So sometimes, I’ll use Thameslink to Blackfriars to visit the Tate Modern and then after my visit, I’ll walk over the Wobbly Bridge and take a bus home. Thameslink is also an easy way to visit St. Paul’s and in a few years, the new Museum of London will be accessed from Farringdon station. I haven’t used Luton Airport in years, as getting there by train is a bit tedious. But I regularly use Gatwick Airport, usually by getting a bus to and from London Bridge station and then using Thameslink. West Hampstead station on the Overground has recently been rebuilt and regularly I come home by changing between Thameslink and the Overground. There is also a Marks & Spencer by the station, which helps too. The area is becoming a major interchange and if the West London Orbital Railway is created, the Overground will be taking over or adding a platform at West Hampstead Thameslink station. Does Thameslink Cater For All Passengers? I say this deliberately, as I think that Thameslink concentrates more on the longer distance and airport passengers, rather than those, who use it as another North-South line across London. In the central core section between Blackfriars and St. Pancras International stations, the trains will run at a frequency of 24 trains per hour (tph) or a train every two and a half minutes. Trains will run automatically at a frequency, that is higher than many rapid transit systems in the world. 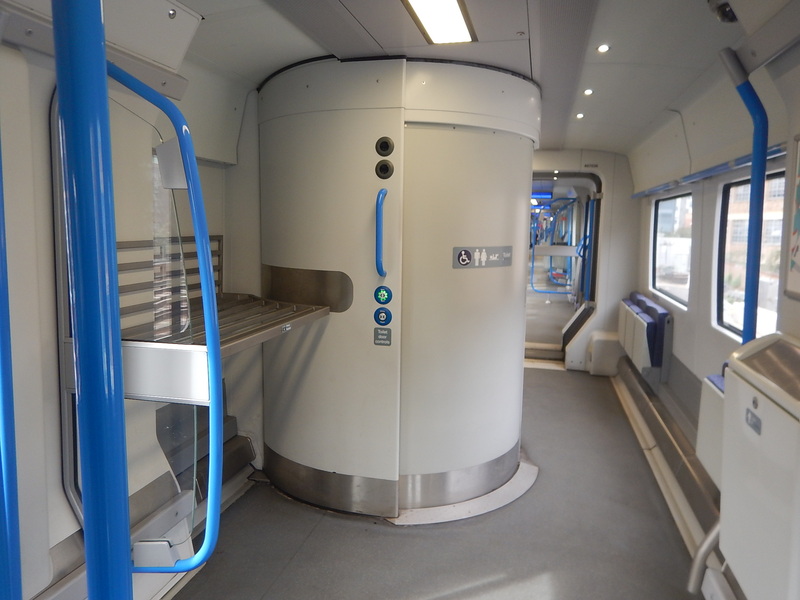 From Gatwick Airport in the South to Elstree & Borehamwood and Hadley Wood in the North, Thameslink is part of London’s Oyster/Contactless Ticketing Zone. In Oyster Card Scheme Extension Agreed, I wrote about how the zone is being extended to Luton Airport Parkway and Welwyn Garden City. So increasingly, Thameslink will be covered by London’s ticketing, that is increasingly used by residents, commuters and visitors. Thameslink has several interchange stations with the Overground and Underground. In addition East Croydon, Mitcham Junction and Wimbledon are interchanges with Tramlink and Blackfriars and London Bridge are interchanges with the river buses. This is a bone of contention with many! Including myself! According to the Wikipedia entry for the Tube Map, Thameslink was shown on the map between 1977 and 1998. So why was it removed? I was on the platform at City Thameslink station and needed a Tube Map. Thameslink is very much part of London’s rail network. It should be treated as such, by doing the following. Extending Oyster/Contactless ticketing to all Thameslink stations. Adding all or part of Thameslink to the Tube Map. Putting a Tube Map on all station platforms in the London area. But this mess has existed for twenty years, since Thameslink was removed from the Tube Map. After photographing the artwork at the new Barbican entrance to Farringdon station, I went to the current station entrance with the aim of getting to Tottenham Court Road station. Obviously, when Crossrail opens, this will be a single-station hop on Crossrail, but there is no obvious quick way as present. So out of curiosity, I asked one of the station staff, what is the recommended route. She said, that the easiest way is to walk to Chancery Lane station and take the Central Line. I also asked her why Thameslink, which is so much part of Farringdon station and will be such an important route at the station after Crossrail opens. She said, but that’s National Rail. So I walked to Chancery Lane. It was a very hot day and uphill. But I made it without difficulty. Crossrail will certainly make my journey easier, but I can’t help feeling that some journeys from Farringdon are better done using Thameslink. Currently, I would do this journey using Thameslink, but what will Transport for London want us to do? Use Crossrail to Moorgate and get the Northern Line. Use Crossrail to Bond Street and get the Jubilee Line. Use Crossrail to Whitechapel and get the Jubilee Line. I shall still use Thameslink. Currently, I would do this journey using Thameslink to Blackfriars and then get the Circle or |District Lines. I suspect that Transport for London would recommend one of these. Use the Circle Line all the way. Easy but long. Go to Kings Cross on the Circle or Metropolitan Lines and get the Victoria. Not the easiest with a heavy case. I shall continue to use Thameslink. The new Museum of London will be built close to Farringdon station. I think, it will end up as one of London’s top museums. But is it easy to get to the British Museum, National Gallery,Tate Modern and all those other museums in South Kensington. The British Museum will be just a stop on Crossrail, when that opens, but for the others Thameslink will play a part. For these routes and other reasons, Thameslink must be on the Tube Map. Cambridge and Gatwick Airport are two of the most important destinations within an hour of Central London. The outer branches of Thameslink to East Croydon, St. Albans, Welwyn Garden City and Wimbledon act in a similar manner to Underground Lines. The central core of Thameslink will be used by many as just another Underground Line. The London Overground is on the Tube Map. Crossrail will be on the Tube Map. For these and other reasons, the London sections of Thameslink should be on the Tube Map. If Thameslink should be added, what about the Northern City Line? This amateur Tube Map is published in Gizmondo. It is a brave attempt to make something that is getting increasingly complicated, more readable. As I travel around Europe, I see some terrible maps, but the biggest sin is places, where they show their maps far to small or place them so you have to be nearly two metres tall to see them. London has a unique advantage in that many stations have been designed so you go down the escalators, you are often in a large spacious lobby, with often quite large flat walls. Also with the removal of booking offices, there is now often a sizeable flat wall, as you enter the station from the street. The current common map in stations is printed in A0 format which is 841 x 1189 millimetres. But there are larger paper sizes. So why not use 2A0 (1189 x 1682 mm.) or even 4A0 (1682 z 2378 mm.)? They could be printed direct onto high-strength vinyl in a similar way to the advertising you see wrapped around buses and trains. Not all maps would be this size, but I believe putting them in prominent locations on the transport network would be a good idea. After all, we’re always being told Big is Beautiful. Eventually, as electronic screens get larger and more affordable, these could be used. It doesn’t really matter what the map looks like, as I hope any bad ones would never be displayed. But size and readability is everything! 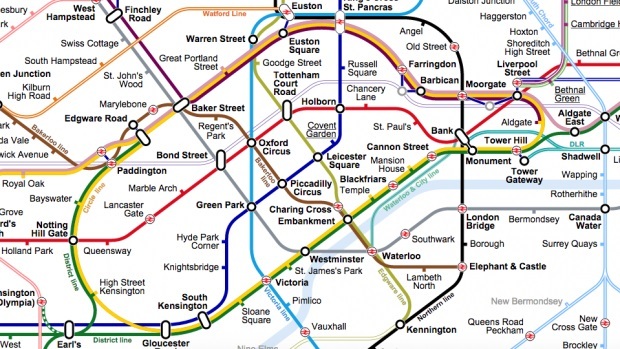 This report on CityLab says that the new tube map is getting some serious hate. I think that TfL aren’t that pleased with the new Tube Map, as on the newly-added Overground stations, the new Tube and Rail map is more common. As all London’s railways get more and more connected by better stations, it’s probably going to be the more important map in the end. One thing I’d like to see is a much larger Tube and Rail map on the wall in strategic places, like perhaps in the entrance hall to a station or on the often blank wall you face, when you come down the escalator. A Virgin customer service guy at I think Coventry, told me that he’d like to see all London connected stations have the Tube and Rail Map, as he was always being asked difficult questions, that customers could answer from such a map.